Set of 3 contracts setting out the conditions in which a music company engages artists in respect to their services as recording artists, songwriters and live performers. It also grants the music company merchandise, sponsorship and endorsements rights for the use of the artists’ names, likenesses and related intellectual property. 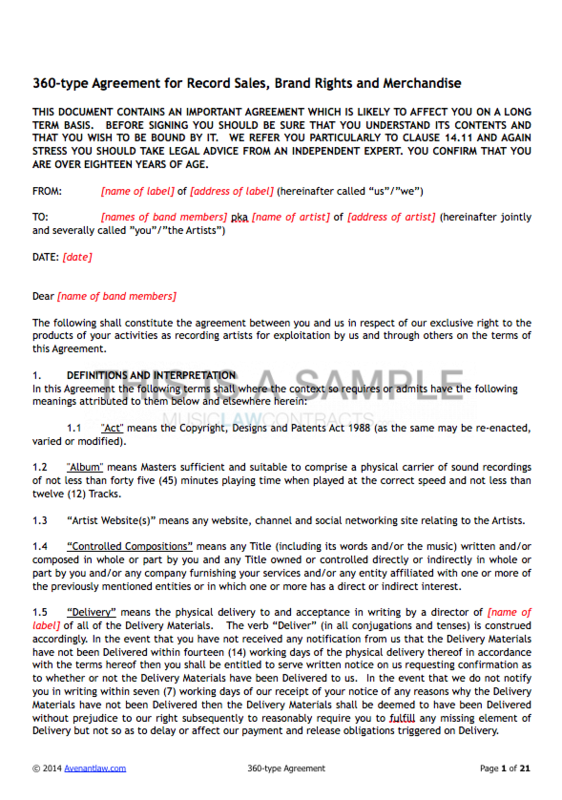 Set of 3 different contracts setting out the conditions in which a music company engages artists in respect to their services as recording artists, songwriters and live performers. It also grants the music company merchandise, sponsorship and endorsements rights for the use of the artists’ names, likenesses and related intellectual property (the rights assigned vary from version to version). 360-type deals have come around as the recording labels response to three major trends in the music industry in recent years: (1) the steady decline of revenue from record sales, (2) the increase in prices of tickets to live events and fan expenditure on merchandise and (3) the strengthening of the capabilities of the collecting societies and publishers getting better at their roles which translates in income from public performance and synchronisation becoming more and more significant. Read our related blog here.